On-farm study reveals positive relationship between gas transport capacity and organic carbon content in arable soil On-farm study reveals positive relationship Tino Colombi et al. Arable soils may act as a sink in the global carbon cycle, but the prediction of their potential for carbon sequestration remains challenging. Amongst other factors, soil aeration is known to influence root growth and microbial activity and thus inputs and decomposition of soil organic carbon. However, the influence of soil aeration on soil organic carbon content has been explored only little, especially at the farm level. Here, we investigated relationships between gas transport properties and organic carbon content in the topsoil and subsoil of 30 fields of individual farms, covering a wide range of textural composition. The fields were managed either conventionally, organically, or according to no-till practice. Despite considerable overlap between the management systems, we found that tillage increased soil gas transport capability in the topsoil, while organic farming resulted in higher soil organic carbon content. Remarkably, higher gas transport capability was associated with higher soil organic carbon content, both in the topsoil and subsoil (0.53 < R2 < 0.71). Exogenous organic carbon inputs in the form of crop residues and organic amendments, in contrast, were not related to soil organic carbon content. Based on this, we conjecture that higher gas transport capability resulted in improved conditions for root growth, which eventually led to increased input of soil organic carbon. Our findings show the importance of soil aeration for carbon storage in soil and highlight the need to consider aeration in the evaluation of carbon sequestration strategies in cropping systems. Colombi, T., Walder, F., Büchi, L., Sommer, M., Liu, K., Six, J., van der Heijden, M. G. A., Charles, R., and Keller, T.: On-farm study reveals positive relationship between gas transport capacity and organic carbon content in arable soil, SOIL, 5, 91-105, https://doi.org/10.5194/soil-5-91-2019, 2019. Arable soils play a crucial role in the global carbon cycle because they can act both as a terrestrial carbon sink and source (Lal, 2004; Smith et al., 2008; Zomer et al., 2017). The balance between carbon inputs from plant roots, aboveground litter and organic amendments, and the decomposition of soil organic matter by heterotrophic soil organisms ultimately determines soil organic carbon content. Soil carbon dynamics are highly dependent on environmental factors, ranging from soil mineralogy and chemical properties and soil structure and related physical conditions to local climatic conditions and their effects on soil temperature and moisture (Manzoni et al., 2012; Rasmussen et al., 2018; Young et al., 1998). Soil management, including crop rotations, tillage, cover crops, and the application of organic amendments, is known to affect soil organic carbon content. However, discordant results on the effects of specific soil management approaches on carbon contents have been reported (Chan et al., 2003; Gattinger et al., 2012; Govaerts et al., 2009; Leifeld et al., 2009; Powlson et al., 2014; Smith et al., 2008), which merits further investigation to better understand factors and processes that control soil organic carbon content in arable soils. Plants convert carbon dioxide into organic carbon through photosynthesis. A range of studies showed that up to 70 % of the total organic carbon in arable soil is derived from roots in the form of root biomass and root exudates (Balesdent and Balabane, 1996; Kätterer et al., 2011; Kong and Six, 2010; Rasse et al., 2005). Root growth is greatly affected by soil structure and related physical properties and processes such as soil aeration, water holding capacity, and soil penetration resistance. High penetration resistance, low water holding capacity, and poor soil aeration and the resulting hypoxic conditions result in decreased root growth (Bengough et al., 2011; Jin et al., 2013; Rich and Watt, 2013; Valentine et al., 2012). Soil aeration is controlled by gas diffusivity through diffusive transport and air permeability through advective transport. Both gas diffusivity and air permeability are key properties that constitute the soil physical constraints on soil aeration (Horn and Smucker, 2005). Gas transport properties are often estimated from proxy values such as total and air-filled porosity. However, because these proxies do not account for pore connectivity and tortuosity, which are crucial for air circulation and thus oxygen concentration in soil air, they do not accurately describe gas transport in soil. Therefore, relative gas diffusion coefficients and air permeability need to be quantified to assess the gas transport capability of soil. Soil structure and associated soil physical properties are greatly affected by soil management. Tillage has been shown to improve penetrability and aeration of the topsoil (Colombi et al., 2018; Dal Ferro et al., 2014; Martínez et al., 2016a, b; Schjonning and Rasmussen, 2000). However, long-term tillage can also lead to decreased gas transport capability and high penetration resistance in both the topsoil (Kahlon et al., 2013) and the subsoil (Martínez et al., 2016a, b). Diverse crop rotations that include ley and deep rooting species such as rapeseed and oilseed radish increase soil macro porosity (Chen et al., 2014; Lesturgez et al., 2004; Stewart et al., 2014; Young et al., 1998), which results in better aeration, increased water holding capacity, and decreased penetration resistance. Permanent soil cover and organic amendments have been shown to increase water infiltration and soil water retention and to improve soil aeration and penetrability (Albizua et al., 2015; Bronick and Lal, 2005; Kahlon et al., 2013). Several studies showed that high soil organic carbon content coincides with good soil aeration, high water holding capacity, and low penetration resistance (Albizua et al., 2015; Celik, 2005; Diacono and Montemurro, 2010; Kahlon et al., 2013; Martínez et al., 2016a, b; Rasool et al., 2007; Reynolds et al., 2008; da Silva et al., 2014). These studies were, however, limited to one or a few field sites and thus covered only a small diversity of soil textures, which makes it difficult to link soil physical properties to soil organic carbon content. Moreover, the results were obtained from field plot studies where agricultural management may differ substantially from the conditions on commercial farms. Soil physical properties in general and soil aeration in particular were proposed to play a key role in the regulation of carbon cycling in arable soil (Qi et al., 1994). This is strongly supported by the close interrelation between soil aeration, the resulting concentrations of oxygen in soil and air, and root development (Dresbøll et al., 2013; Porterfield and Musgrave, 1998; Thomson et al., 1992; Watkin et al., 1998; Young et al., 1998). It is known that root growth slows down upon decreasing oxygen concentrations in soil air of just a few percentages (Eavis, 1972; Garnczarska and Bednarski, 2004; Grable and Siemer, 1968; Qi et al., 1994). Such reductions in the concentration of oxygen in soil air occur regularly in arable soils (Buyanovsky and Wagner, 1983; Cannell et al., 1984; Weisskopf et al., 2010). Furthermore, roots tend to grow preferably towards well-aerated compartments in soil (Colombi et al., 2017; Porterfield and Musgrave, 1998). Besides promoting organic carbon input through root growth, high gas transport capacity of soil may also fuel microbial growth and activity and therefore decomposition of soil organic matter (Balesdent et al., 2000; Keiluweit et al., 2016, 2017; Young et al., 1998). 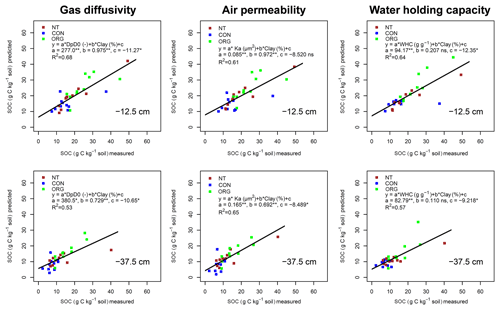 Quantitative information about the relationships between soil gas transport capability and soil organic carbon contents in cropping systems is, however, limited, and soil aeration is typically not included in soil quality assessments (Bünemann et al., 2018). To gain a better understanding of the potential of soil management approaches to contribute to carbon sequestration in arable soils, the role of soil aeration has to be investigated. To understand the interrelations between soil management, aeration, and organic carbon content at relevant scales and under realistic management conditions, on-farm studies carried out at multiple sites are needed. Here, we investigated relationships between gas transport capability and organic carbon content in arable soil on-farm covering a range of textural compositions. The study was conducted on 30 fields of individual farms in the eastern part of Switzerland. The fields were managed according to three different management systems: (i) conventional farming without tillage, (ii) conventional farming with tillage, and (iii) organic farming with tillage. Gas diffusivity, air permeability, and soil organic carbon content were quantified in the topsoil and the subsoil in order to evaluate whether soil organic carbon content is related to soil gas transport properties. Additionally, soil penetration resistance, total and air-filled porosity, soil textural composition, water holding capacity, and microbial biomass and respiration were assessed. The study was performed on 30 separate fields of at least 1 ha in size, each belonging to individual farms in the eastern part of Switzerland. The fields were managed following three different management systems: conventional (integrated) farming with no tillage practised for 5 years, conventional (integrated) farming with tillage practised for 5 or more years, and organic farming with tillage practised for at least 5 years. In the remainder of this paper, we refer to the three different management systems as “no-till”, “conventional”, and “organic” systems, respectively. The system of integrated farming in Switzerland includes a number of practices aiming to enhance the sustainability of cropping systems, which are summarized as the “proof of ecological performance”. Farmers need to comply with the proof of ecological performance in order to receive full state subsidies. It includes an even nutrient balance; a diverse crop rotation including crops from different botanical families like small grain cereals, maize, rapeseed, and grain and forage legumes; and the avoidance of bare fallow soil and targeted use of plant protection products (Swiss Federal Council, 2014). Ten farms per management system were selected in order to keep a balanced study design. Soil samples were collected in spring 2016 between 20 April and 27 May, and winter wheat (Triticum aestivum L.) sown in autumn 2015 was grown in all fields. The different fields were arranged as triplets, i.e. one field of each management system was in proximate location to one field of the two other management systems. Soil samples were taken for each triplet at the same day. Soil samples were collected in a circular sampling area of around 300 m2. Wheel tracks were excluded for sampling. Undisturbed cylindrical soil core samples of 100 mL volume and 5.1 cm diameter were taken for different soil physical measurements, including gas transport properties and water holding capacity. Composite samples were used for the determination of soil texture, soil organic carbon content, and microbial biomass and respiration. Samples were taken from two different depths, representing the topsoil and the subsoil of each field. Undisturbed cylinder samples were sampled from 10–15 and 35–40 cm depth, while composite samples were taken from 5–20 and 25–50 cm depth. Hence, the mean sampling depths for both types of samples were 12.5 and 37.5 cm (Fig. 1). Five undisturbed cylinder samples were collected per depth and field. The composite samples consisted of 15–20 separate auger samples. Both undisturbed cylinder and composite samples were taken, evenly spaced along two transects crossing the sampling area of 300 m2. Figure 1Schematic overview indicating soil layers and respective depths used for composite samples, penetrometer insertions, and cylindrical soil core samples. The samples were closed at the bottom and the top and stored in the dark at 4 ∘C until processing. The soil samples were weighed to determine soil moisture at sampling. The soil cylinders were slowly saturated from below and equilibrated on a ceramic suction plate to 30 and 100 hPa matric suction. By weighing at saturation and at both matric suctions, the respective gravimetric water contents were calculated. Gravimetric water content at 100 hPa matric suction, which is typically seen to represent field capacity (Schjonning and Rasmussen, 2000), is defined in this paper as the soil water holding capacity. The relative gas diffusion coefficient and air permeability were measured at 30 and 100 hPa matric suction, as described by Martínez et al. (2016a). To obtain soil bulk density, the soil samples were dried at 105 ∘C for at least 72 h before weighing. Volumetric water content was calculated from bulk density and gravimetric water content. Total porosity was determined based on soil bulk density and particle density. Particle density was measured for each field and sampling depth. Finally, air-filled porosity at 30 and 100 hPa matric suction was calculated from total porosity and the respective volumetric water content. Composite samples were processed following the reference method of the Swiss Agricultural Research Stations (Swiss Federal Research Stations, 1996). Before measurements were performed, the composite samples were cleaned from animal and plant debris and then sieved at a mesh width of 2 mm. Soil texture was determined with the pipette method, while soil organic carbon content was quantified by the dry combustion method according to ISO 10694. Soil microbial biomass was estimated from substrate induced respiration measurements, as described by Anderson and Domsch (1978). An equivalent of 50 g soil dry matter was amended with 150 mg glucose before incubation at 22 ∘C for 7 days. Following Heinemeyer et al. (1989), an infrared gas analyser was used to measure initial CO2 release. Soil microbial biomass (Cmic) was then calculated from these initial respiration rates according to Kaiser et al. (1992), assuming 1 µL CO2 g−1 dry soil h−1 to be equivalent to 30 µg Cmic g−1 dry soil. Furthermore, soil basal respiration (microbial respiration) was measured in pre-incubated samples (7 days at 22 ∘C, equivalent of 20 g dry soil) as CO2 released over a period of 48 h, starting at the second day of the incubation (Swiss Federal Research Stations, 1996). Additional soil physical information was obtained from cone penetrometer measurements. Ten penetrometer insertions were performed in each field across the 300 m2 sampling area down to a depth of 50 cm (Fig. 1) using an Eijkelkamp penetrologger (Eijkelkamp Agrisearch Equipment, Giesbeek, the Netherlands). The cone had a base area of 1 cm2 and a full apex angle of 60∘, and penetration resistance values were obtained in 1 cm steps. To represent the same soil depths as for composite and cylinder samples, average values were calculated for 5 to 20 cm depth and 25 to 50 cm depth. Soil water content at the time of penetrometer measurements was obtained from the undisturbed soil cylinder samples. As described by Büchi et al. (2019), we followed the French “Indigo” method (Bockstaller et al., 1997) and used farmer interviews to calculate the amount of exogenous organic carbon inputs during the 5 years prior to the study. Data on exogenous organic carbon inputs were available for 29 of the 30 fields that were included in the current study. Using information on crop rotation and residue management allowed us to estimate the amount of organic matter input that was derived from crop residues. Organic matter inputs from organic amendments were estimated based on the number and amount of applications and the form of the amendment (e.g. compost, slurry, or manure) using isohumic coefficients for the different types of organic fertilizers (CSICM, 2010; CTACF, 2006; Sinaj and Richner, 2017). The total amount of exogenous input of organic matter was calculated as the sum of organic carbon derived from crop residues and organic amendments. Organic matter was converted into organic carbon, assuming an organic-matter–organic-carbon ratio of 1.724 (Soil Survey Staff, 2011). As in Eq. (1), the effects of soil management, depth, and their interaction are denoted by α, β, and αβ, respectively, and were set as fixed effects while the field (γ) was set as a random effect. The effects of clay content (δ) were included as a fixed co-variable into the model. This allowed us to account for the variability in soil texture among sites and thus to account for effects related to the site-specific soil texture. Clay content was chosen due to its known association with soil organic carbon content (e.g. 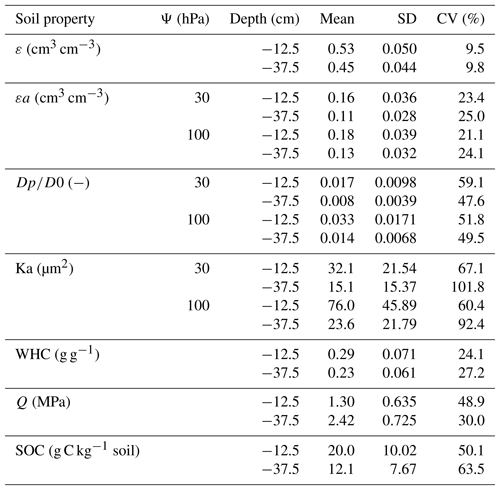 Rasmussen et al., 2018) and soil structure and related soil physical properties (e.g. Dexter, 1991). Furthermore, clay content showed the highest variability among sites of all texture fractions (Table 1). Since no significant effect of the management system and the interaction between the management system and sampling depth on clay content was found (Table 1), interactions between clay content, depth, and management systems were not tested for in the analysis. For soil penetration resistance, the gravimetric water content at sampling was added as an additional fixed co-variable to the model due to the known influence of soil moisture on penetration resistance (Bengough et al., 2011; Busscher, 1990). Analysis of covariance (ANCOVA) was then used to test for significant effects of fixed effects. Air permeability was transformed to the base-10 logarithm for linear mixed model analysis. Pairwise comparison of group mean values within one sampled depth was performed using least significant difference (LSD) tests at p<0.01 and p<0.05 using the agricolae package for R (Mendiburu, 2015). Table 1Effects of management system (M), sampling depth (D) and their interaction (M : D) on soil texture, analysed with linear mixed models (Eq. 1) followed by analysis of variance (ANOVA). * indicates significant effects at p<0.01. Average values for the different depths represent means of three management systems (no-till, conventional, organic and n=10). Abbreviations: SD is Standard deviation, and CV is coefficient of variation. where SOC represents soil organic carbon content, and the first explanatory variable (x1) represents either gas diffusivity, air permeability, air-filled porosity, soil penetration resistance, or water holding capacity. As done in Eq. (2), clay content was included as a second explanatory variable into the regression model, which allowed us to account for the site-specific soil textural composition. Regressions were carried out separately for both levels of matric suction at which gas diffusivity, air permeability, and air-filled porosity were determined. To evaluate the influence of the sampling date (expressed as the day of the year) and the amount of exogenous organic carbon input on soil organic carbon content, both were included as additional predicting variables in the regression model presented in Eq. (3). where Y represents soil microbial biomass and soil respiration, whereas the first explanatory variable (x1) denotes either soil organic carbon content or soil microbial biomass. Due to strong effects of the sampling depth on all soil properties assessed, all multiple linear regressions were performed separately for each soil depth. The regression models were evaluated with the linear least-squares method (lm), which is implemented into the R package stats (R Core Team, 2017). Considerable variability in soil textural composition was observed among the 30 fields that were part of the study. Clay, silt, and sand contents varied from 11.0 % to 48.4 %, 19.7 % to 43.9 %, and 16.5 % to 60.4 %, respectively. Soil texture did not differ significantly between the three different soil management systems. Slightly lower clay and higher sand contents were observed in the topsoil in comparison to the subsoil (Table 1). The overall variability in total porosity among the investigated fields was relatively low (coefficient of variation – CV; CV < 10 %; Table 2). Nevertheless, total porosity significantly differed between management systems. In the topsoil it was significantly lower in the no-till system than in the two management systems that include regular tillage (LSD test: p < 0.01). In the no-till system, mean total porosity at 12.5 cm depth was 48.6 % (±3.1 % standard deviation – SD). Total topsoil porosity of the conventional and organic management system was 54.5 % (±3.6 % SD) and 56.1 % (±4.8 % SD), respectively (Fig. 2). Consequently, soil bulk density at 12.5 cm depth was higher in the no-till system than in the two management systems that include regular tillage. In the subsoil, i.e. at 37.5 cm depth, total porosity was significantly higher (LSD test: p<0.05) in the organic management system than in the no-till system (Fig. 2). Table 2Descriptive statistics on soil physical properties and soil organic carbon content across all three management systems. Mean, SD, and CV represent average value, standard deviation, and coefficient of variation, respectively (n=30). Abbreviations: ε is total porosity, εa is air-filled porosity, Dp∕D0 is gas diffusion coefficient, Ka is air permeability, WHC is water holding capacity, Q is soil penetration resistance, SOC is soil organic carbon content, and Ψ is soil matric suction. Figure 2Effects of soil management (M), sampling depth (D), their interaction (M : D), and clay content (Clay) on total soil porosity, air-filled porosity, gas diffusivity, and air permeability (all measured at 100 hPa matric suction) and water holding capacity, analysed with linear mixed models (Eq. 2) followed by analysis of covariance. NT (red), CON (blue), and ORG (green) denote the no-till, conventional, and organic management system, respectively. ** and * indicate significant differences between management systems at individual depths using least significant difference (LSD) tests at p<0.01 and p<0.05, respectively (n=10). Gas transport properties (47 % < CV < 102 %) and, to a lesser extent, air-filled porosity (21 % < CV < 25 %) showed much higher variability among the investigated sites than total porosity (Table 2). Compared to the no-till system, air-filled porosity in the topsoil at 100 hPa matric suction was significantly higher (LSD test: p<0.01) in the organic and conventional management systems, which include regular tillage (Fig. 2). Similar effects of the management system were found for soil gas transport properties, i.e. relative gas diffusion coefficients and air permeability. Compared to the no-till system, gas diffusion coefficients at 100 hPa matric suction were higher by more than 70 % in the organic and conventional system (LSD test: p<0.05). Similar differences between management systems were measured for air permeability at 100 hPa, which was significantly higher (LSD test: p<0.01) in the organic and conventional systems than in the no-till system (Fig. 2). At matric suction of 30 hPa, similar but less pronounced differences of air-filled porosity and gas transport properties between management systems occurred as under drier conditions at 100 hPa matric suction (Supplement Fig. S1). In the subsoil, however, air-filled porosity, gas diffusion coefficients, and air permeability did not differ significantly between the three management systems (Figs. 2 and S1). Despite significant effects of the management system, considerable overlap between the systems was found for gas transport properties and air-filled porosity (Figs. 2 and S1). Water holding capacity was higher in the organically managed system than in the no-till system, both in the topsoil and the subsoil (LSD test: p<0.01). In the topsoil, water holding capacity in the conventional system was significantly higher (LSD test: p<0.05) than in the no-till system, while water holding capacity of the subsoil did not differ between the two systems (Fig. 2). Soil penetration resistance also significantly differed between the management systems. Mean penetration resistance between 5 and 20 cm depth was more than 35 % lower in the organically and conventionally managed system than in the no-till system. In the subsoil the differences in soil penetration resistance between management systems were non-significant. Most likely because of the relatively low variation in soil moisture at the time of measurement, no significant (p=0.28) effects of soil moisture on penetration resistance were found (Fig. S2). As found for soil gas transport properties, overlap between management systems occurred for water holding capacity (Fig. 2) and soil penetration resistance (Fig. S2), and the variability among sites was comparable to that observed for air-filled porosity (24 % < CV < 49 %; Table 2). Significant effects of the soil depth were observed for all soil physical properties. Total and air-filled porosity, gas transport capacities, and water holding capacity (Figs. 2 and S1) were lower in the subsoil than the topsoil. Penetration resistance was higher in the subsoil than in the topsoil (Fig. S2). Clay content and thus the site-specific soil texture affected total and air-filled porosity, air permeability, and water holding capacity, indicating the influence of texture on soil structure and related physical properties. For gas diffusion coefficients and penetration resistance, no significant effect of clay content (p>0.05) was observed (Figs. 2, S1, and S2). The overall variability in soil organic carbon content among sites was comparable to that of gas transport properties (Table 2). 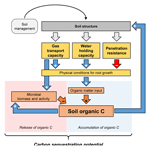 Similar to the results obtained for soil physical properties, considerable overlap in soil organic carbon content between management systems occurred (Fig. 3). Nevertheless, significant differences in soil organic carbon content were observed between management systems. Soil organic carbon content from 5 to 20 cm depth was significantly (LSD test: p<0.05) higher in the organic management system than in the conventional system. Furthermore, soil organic carbon content in the subsoil of the no-till and conventional system was significantly lower (LSD test: p<0.05) than in the organically managed fields (Fig. 3). Exogenous organic carbon inputs in the form of crop residues and organic fertilizers were very similar (p>0.50) between management systems (Fig. 3). Besides soil organic carbon content, significant effects of the management system were found for soil microbial biomass, which was the highest under organic management in both soil layers (LSD test: p<0.05). Microbial respiration did not differ significantly among the three management systems (Table 3). Soil organic carbon content (Fig. 3), as well as microbial biomass and respiration (Table 3), significantly decreased with soil depth and was affected by clay content. Table 3Effects of management system (M), sampling depth (D), their interaction (M : D), and clay content on soil organic carbon, microbial biomass, and microbial respiration, analysed with linear mixed models (Eq. 2) followed by analysis of covariance (ANCOVA). ** and * indicate significant effects at p<0.01 and < 0.05, respectively. Average values for the different depths represent means for no-till (NT), conventional (CON), and organic (ORG) soil management system. Different letters indicate significant differences between management systems at individual depths using least significant difference (LSD) tests at p<0.05 (n=10). Abbreviations: SD is Standard deviation, micC is soil microbial carbon, and Resp is soil microbial respiration. Figure 3Effects of soil management (M), sampling depth (D), their interaction (M : D), and clay content (Clay) on soil organic carbon content, analysed with linear mixed models (Eq. 2) followed by analysis of covariance (n=10), and effects of management on exogenous carbon inputs calculated as described in Büchi et al. (2019) using analysis of variance (NT is n=10, CON is n=9, and ORG is n=10). NT (red), CON (blue), and ORG (green) denote no-till, conventional, and organic management system, respectively. * indicates significant difference between management systems at individual depths using least significant difference (LSD) tests at p<0.05. Multiple linear regression models (Eq. 3) were used to relate soil physical properties to soil organic carbon content. Soil organic carbon content significantly increased with increasing gas diffusion coefficients and air permeability. For the topsoil, multiple R2 values were in the range 0.60 to 0.68, and the regression coefficients for gas diffusivity and air permeability measured at 100 hPa matric suction were highly significant (p<0.01). As in the topsoil, increased gas diffusivity (p<0.05, R2=0.53) and air permeability (p<0.01, R2=0.65) were also related to higher soil organic carbon content in the subsoil (Fig. 4). Similar results were obtained when using gas transport properties measured at 30 hPa instead of the transport properties obtained at 100 hPa to explain organic carbon content (Fig. S3). Collinearities between gas transport properties and clay content did not occur (Fig. S4). 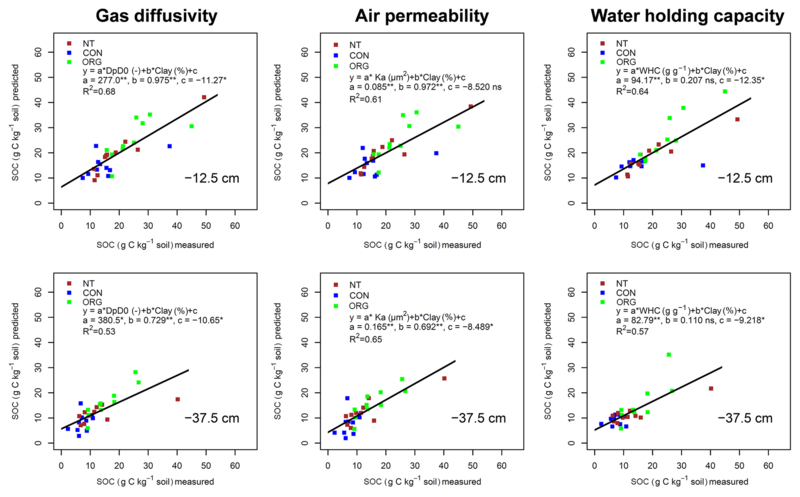 In contrast, no clear relationship between air-filled porosity and soil organic carbon content was observed, since the regression coefficients for air-filled porosity were mostly not significant (Fig. S5). 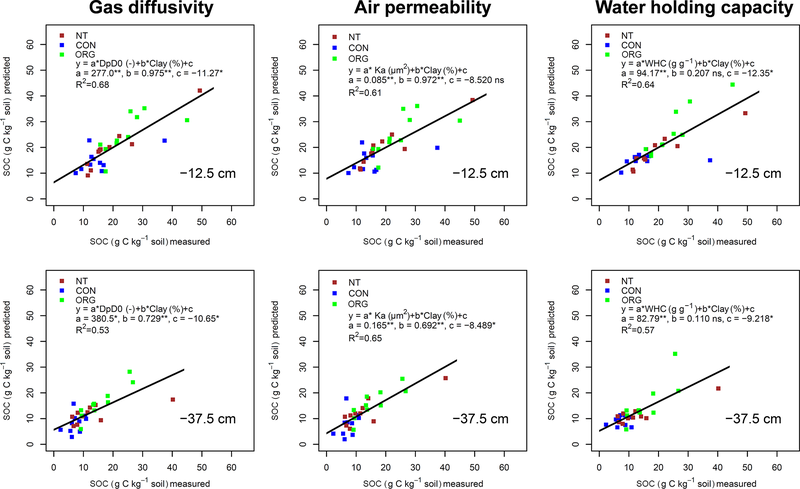 Given these contrasting results, we suggest that direct measurements of gas transport properties such as gas diffusivity and air permeability are better predictors for soil organic carbon content that proxy values such as air-filled porosity. In addition to gas transport properties, soil organic carbon content was significantly (p<0.01) associated with water holding capacity. Increased water holding capacity was related to higher soil organic carbon content in the topsoil and the subsoil (0.57<R2<0.64; Fig. 4). Due to collinearity between water holding capacity and clay content, simple linear regressions between water holding capacity and soil organic carbon content were performed additionally. As observed for multiple linear regressions, water holding capacity and soil organic carbon content were positively related (Fig. S6). Figure 4Multiple linear regression models (Eq. 3) to explain soil organic carbon content as a function of gas diffusion coefficients (Dp∕D0 in −, air permeability – Ka – in µm2) measured at 100 hPa matric suction, water holding capacity (WHC in g3 g−3), and clay content (Clay in %). NT (red), CON (blue), and ORG (green) denote no-till, conventional, and organic management system, respectively. ** and * indicate significant regression coefficients at p<0.01 and p<0.05, respectively, and ns indicates non-significant regression coefficients. R2 represents multiple r-squared values. Due to significant effects of tillage on gas transport properties and water holding capacity (Fig. 2), regressions were also performed separately for the fields that were regularly tilled (i.e. conventional and organic) and remained untilled (i.e. no-till fields). Both in tilled and untilled fields, higher soil gas transport capacity was positively associated with increased soil organic carbon content (Supplemental Tables S1 and S2), while no such relationship was found for air-filled porosity (Table S3). When considering tilled and untilled soils separately, the positive association between water holding capacity and soil organic carbon content was limited to the fields that were subjected to regular tillage (Table S4). Despite trends towards lower soil organic carbon content with increased soil penetration resistance in the topsoil, no significant (p>0.05) relationships between penetration resistance and soil organic carbon content were found (Table 4). Across sampling depths, clay content was positively (p<0.01) related to soil organic carbon content (Figs. 4, S3 and S5). Introducing sampling time as an additional predictor into the regression models showed the that day on which soil samples were taken had no significant effect on soil organic carbon content (Tables S5 to S8). Furthermore, the amount of exogenous carbon input derived from crop residues and organic fertilizers was not related to soil organic carbon content (Tables S9 to S13). Table 4Summary statistics of multiple linear regression models to explain soil organic carbon content as a function of penetration resistance and clay content (Eq. 3). * indicates significant regression coefficients at p<0.01, and ns indicates non-significant regression coefficients. R2 represents multiple r-squared values. Abbreviations: SOC is soil organic carbon content, Q is soil penetration resistance, Clay is clay content, and Int is intercept. The results obtained from the regression analyses (Eq. 3) show that soil organic carbon content in the current study was positively associated with soil physical conditions facilitating root growth, namely high gas transport capability and water holding capacity. Exogenous inputs of organic carbon, in contrast, showed no significant influence on the organic carbon content in the soil. This suggests a positive association between soil physical conditions that facilitates root growth and soil organic carbon content (Fig. 5). 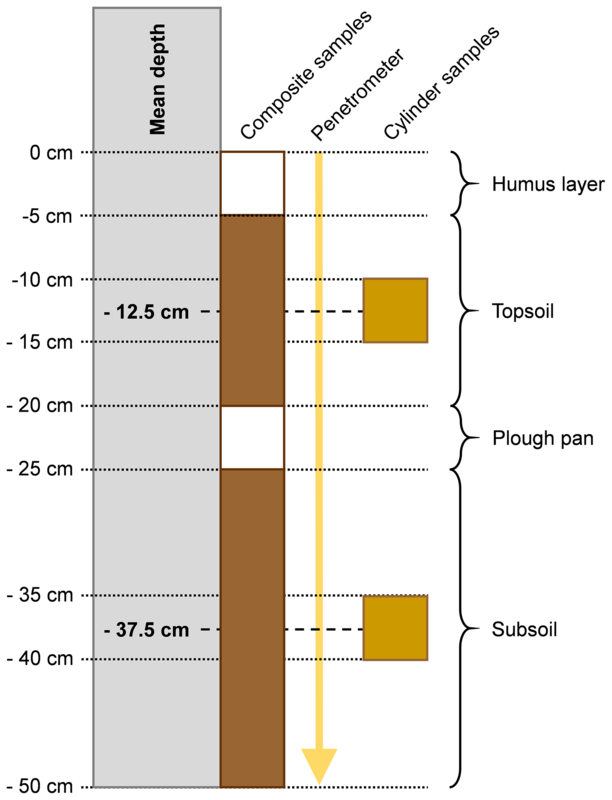 Figure 5Conceptual model illustrating the influence of soil structure and related soil physical properties on soil organic carbon content. Improved soil aeration, water holding capacity, and soil penetrability lead to better physical conditions for root growth, which fuels soil organic matter input and increases soil organic carbon content. In turn, soil structure and related physical properties are further improved. Improved soil aeration and high soil organic carbon content may also fuel microbial growth and activity and thus accelerate soil organic matter decomposition. In both soil layers, higher soil organic carbon content significantly (p<0.01) increased soil microbial biomass (0.75<R2<0.76) and soil respiration (0.64<R2<0.69). Furthermore, higher soil microbial biomass was strongly associated (p<0.01; 0.85<R2<0.86) with increased soil respiration. Except for microbial respiration in the subsoil, no significant influence of clay content on microbial biomass and respiration was found (Table 5). These results indicate that microbial biomass and activity, and thus potential decomposition of soil organic carbon in the investigated soils, were at best only partially related to soil texture. Here, we investigated interrelations between and soil gas transport properties and soil organic carbon content in arable soils. Other than in most field plot studies where different management treatments are compared on the same soil, the current on-farm study included 30 fields with substantial variation in soil texture (Table 1). 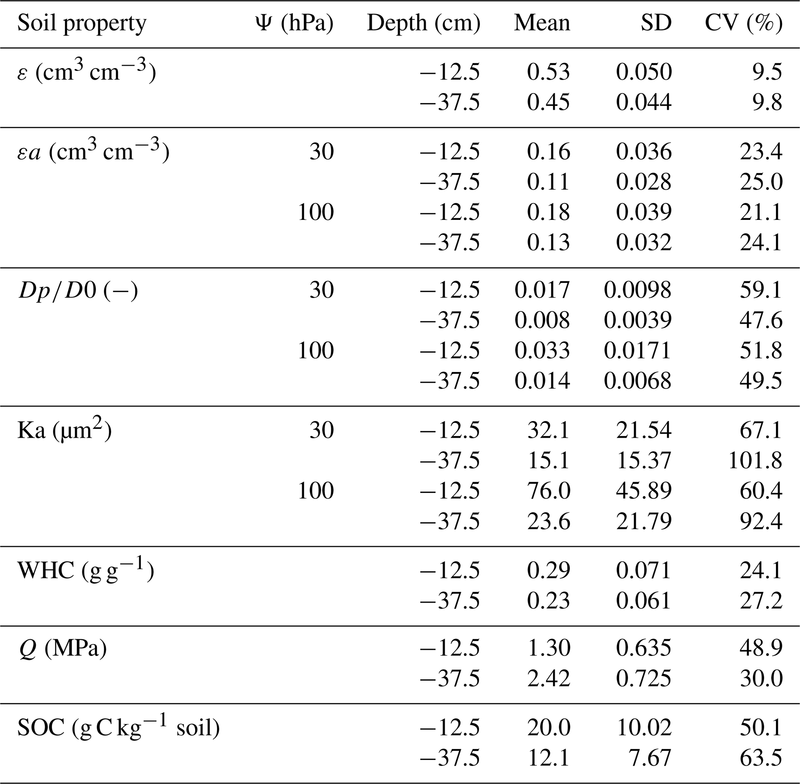 In addition to soil texture, soil gas transport properties as well as soil organic carbon content were highly variable among the investigated fields, both in the topsoil and the subsoil (Table 2). Despite this large variation, significant effects of the soil management system on gas transport properties and soil organic carbon were found, mainly in the top 20 cm of the soil. Our results show that tillage increased gas transport capability and water holding capacity in the topsoil (Fig. 2), while penetration resistance in the topsoil decreased due to tillage (Fig. S2). Thus, physical conditions for root growth (Bengough et al., 2011; Rich and Watt, 2013) were improved in the topsoil of the conventional and organic management system compared to the no-till system. Similar findings were obtained from field plot experiments, where tillage resulted in increased gas transport capability and water holding capacity and lower penetration resistance in the topsoil and occasionally also in the subsoil (Azooz et al., 1996; Dal Ferro et al., 2014; Kahlon et al., 2013; Martínez et al., 2016a, b; Pires et al., 2017; Schjonning and Rasmussen, 2000). As shown previously (Birkhofer et al., 2008; Gattinger et al., 2012; Mäder et al., 2002), soil organic carbon content was higher under organic management than in the no-till and conventional system (Fig. 3). Hence, differences in soil physical properties were mainly caused by the tillage system, while soil organic carbon content was more related to organic farming. Table 5Summary statistics of multiple linear regression models to explain microbial biomass and soil microbial respiration as a function of soil organic carbon content, microbial biomass, and clay content (Eq. 4). ** and * indicate significant regression coefficients at p<0.01 and p<0.05, and ns indicates non-significant regression coefficients. R2 represents multiple r-squared values. Abbreviations: micC is soil microbial carbon, Resp is microbial respiration, SOC is soil organic carbon content, Clay is clay content, and Int is intercept. The large variation in soil texture, gas transport properties and soil organic carbon content among sites enabled us to relate soil organic carbon content to soil gas transport capability and clay content (Eq. 3). Soil organic carbon content significantly increased with higher gas transport capability in the topsoil and the subsoil (Fig. 4). In agroecosystems, soil organic carbon is derived from roots in the form of root biomass and root exudates as well as from crop residues and organic amendments such as slurry, manure, and compost. Recently it was reported that the contribution of aboveground litter to soil organic carbon content might exceed that of roots. This is due to higher decomposability of aboveground residues compared to roots, resulting in more microbial by-products and eventually higher amounts of long-term stabilized soil organic carbon (Cotrufo et al., 2013, 2015; Lavallee et al., 2018). However, numerous other studies showed that 60 %–70 % of soil organic carbon in arable soil is derived from roots, suggesting that roots are the dominant input source for soil organic carbon (Balesdent and Balabane, 1996; Kätterer et al., 2011; Kong and Six, 2010; Rasse et al., 2005). Therefore, soil physical properties fostering root growth, such as high soil gas transport capability, will lead to increased organic matter input and eventually higher soil organic carbon content (Fig. 5). This is supported by previous studies, which showed that impeded soil aeration and the resulting decrease of oxygen concentrations in soil air slows down metabolic activity of roots and reduces root growth (Bengough et al., 2011; Dresbøll et al., 2013; Eavis, 1972; Garnczarska and Bednarski, 2004; Grable and Siemer, 1968; Qi et al., 1994; Thomson et al., 1992; Watkin et al., 1998). Root growth may also be facilitated by high water holding capacity and low soil penetration resistance (Bengough et al., 2011; Rich and Watt, 2013), which consequently also increases soil organic matter inputs. We observed a strong positive relationship between water holding capacity and soil organic carbon content (Figs. 4, S6), while soil penetration resistance and organic carbon content were not related (Table 4). This can most likely be explained by the relatively moist conditions at the time of measurements (Fig. S2), as relationships between organic carbon content and penetration resistance are stronger under dry conditions (Soane, 1990). 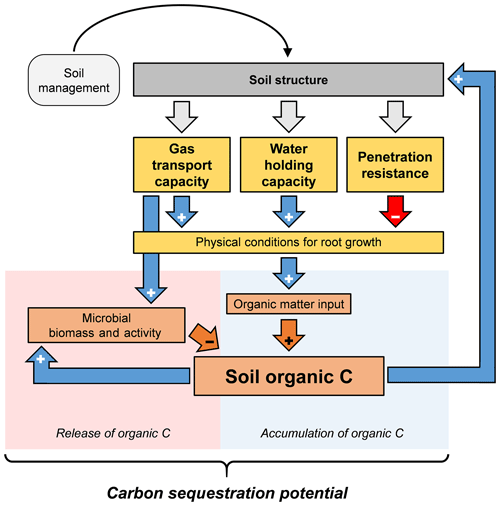 Based on the presented results and existing literature, we propose a positive feedback cycle between soil structure and related soil physical properties, root growth, and thus organic matter input and soil organic carbon content (Fig. 5). Since no significant influence of exogenous carbon inputs on soil organic carbon content was found (Tables S9 to S13), we suggest that the differences in soil organic carbon content among the investigated sites were caused by differences in root growth. Soil structure is of crucial importance in this feedback cycle because soil aeration, water retention, and soil penetrability strongly depend on the structure of the soil. It is known that good soil aeration, high water holding capacity, and low penetration resistance increase root growth (Bengough et al., 2011; Jin et al., 2013; Rich and Watt, 2013) and therefore the input of soil organic matter. In turn, higher soil organic carbon content improves soil structure and thus increases soil aeration, water holding capacity, and soil penetrability (Carter et al., 2007; Martínez et al., 2016b; Young et al., 1998), which further facilitate root growth (Fig. 5). Experiments in which these functions can be controlled independently of soil structure would be needed to quantify their relative contribution to soil carbon dynamics. Young et al. (1998) discussed interrelations between soil structure and related physical functions and properties, soil life, and soil organic carbon. Amongst other soil physical functions, soil aeration is of particular importance because it is not only important for root growth but also for microbial biomass and thus the decomposition of organic matter (Balesdent et al., 2000). In the current study, higher soil organic carbon content was related to increased microbial biomass and activity (Table 5). Hence, there might have been an indirect relationship between soil aeration and the decomposition of soil organic carbon (Fig. 5). It is known that anaerobic microsites in soil, which are characterized by minimal microbial activity, are important regulators for the stabilization of organic carbon (Keiluweit et al., 2016, 2017). Due to root respiration and local carbon dioxide accumulation, such anaerobic microsites are likely to form around roots (Koop-Jakobsen et al., 2018). For the build-up of soil organic carbon at larger scales, however, aerobic conditions are needed, as they promote root growth (Dresbøll et al., 2013; Grzesiak et al., 2014; Thomson et al., 1992; Watkin et al., 1998). Furthermore, roots are known to grow towards well-aerated soil compartments (Colombi et al., 2017; Porterfield and Musgrave, 1998). Hence, aerobic parts of the soil are likely to be enriched with new organic matter. The positive relationship between gas transport properties and soil organic carbon content obtained here (Fig. 4) suggests that in our study, effects of soil aeration on organic matter inputs were more pronounced than eventual stimulation of decomposition. It has been emphasized that the close interactions between physical, chemical, and biological processes need to be accounted for when evaluating the carbon storage potential of arable systems (Qi et al., 1994; Rasmussen et al., 2018; Young et al., 1998). Despite the knowledge about the influence of soil gas transport capability and oxygen concentration in soil air on root growth, the effects of soil aeration on soil organic carbon content have received only little attention. Unlike water and mineral nutrients, oxygen is not directly acquired by soil-inhabiting organisms, including plants, soil fauna, and microbes. However, oxygen largely regulates the growth and metabolism of these organisms and thus plays a crucial role in carbon cycling. As shown here and in previous studies (Albizua et al., 2015; Azooz et al., 1996; Carter et al., 2007; Dal Ferro et al., 2014; Kahlon et al., 2013; Martínez et al., 2016b; Pires et al., 2017; Schjonning and Rasmussen, 2000), agricultural management affects soil structure and therefore soil gas transport properties. Ultimately, this has consequences for root growth (Thomson et al., 1992; Watkin et al., 1998; Dresbøll et al., 2013; Grzesiak et al., 2014) and thus affects the input of soil organic matter through roots. The results presented here, which were obtained on-farm and therefore represent relevant scales and management conditions, reveal that increased organic carbon content in arable soil is related to high gas transport capability. Based on results obtained from 30 fields of commercial farms, we found a positive relationship between gas transport capability and organic carbon content of arable soil. As exogenous organic carbon inputs were not related to soil organic carbon content, differences in soil organic carbon content among the investigated sites were most likely caused by differences in root growth. 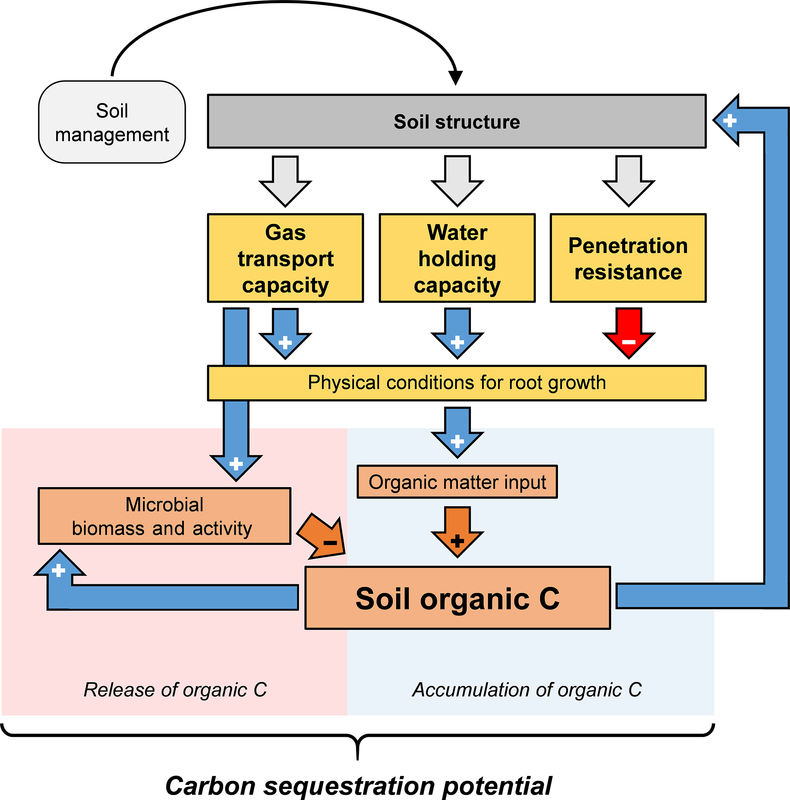 We therefore propose that higher soil organic carbon content in well-aerated soils resulted from enhanced root growth, which was facilitated by increased soil gas transport capability. Good soil aeration might also fuel microbial growth and activity, leading to accelerated decomposition of soil organic carbon. The results obtained here indicate that for the current study, the effects of aeration on carbon inputs were more pronounced than stimulation of carbon decomposition by heterotrophic soil life. However, opposite relationships between soil aeration and organic carbon content may occur in different land use systems or under different climatic conditions. We suggest that aeration plays a crucial yet underestimated role in the potential of arable soils to act as a terrestrial carbon sink. Future research and policy measures that aim to increase carbon content in arable land use systems need to account for the effects of soil management on soil aeration and the associations between soil gas transport capability and soil carbon dynamics. Data will be made available upon publication of the article. The reserved DOI is https://doi.org/10.5281/zenodo.2587708 (Colombi et al., 2019). The supplement related to this article is available online at: https://doi.org/10.5194/soil-5-91-2019-supplement. TC and FW contributed equally to this paper. TK, JS, MvdH, RC, FW, and LB conceived the study. FW, MS, and KL conducted the sampling. FW and MS carried out laboratory measurements. Data analysis and interpretation was performed mainly by TC, with contributions from FW, TK, and LB. TC prepared the paper, with contributions from all co-authors. We express our sincere gratitude to all farmers for their cooperation and for the possibility to sample in their fields. Diane Bürge, Andrea Bonvicini, and Susanne Müller (Agroscope Zurich) are thanked for their help in the laboratory, and Julia Hess, Joel Hofer, Marcel Meyer, and Juselin Gurrier (Agroscope Zurich) are thanked for their assistance during field sampling. This study was funded by the Swiss National Science Foundation (project no. 406840-161902) within the National Research Programme NRP 68 “Soil as a Resource” (http://www.nrp68.ch, last access: 8 March 2019), which is gratefully acknowledged. Albizua, A., Williams, A., Hedlund, K., and Pascual, U.: Crop rotations including ley and manure can promote ecosystem services in conventional farming systems, Appl. Soil Ecol., 95, 54–61, https://doi.org/10.1016/j.apsoil.2015.06.003, 2015. Anderson, J. P. E. and Domsch, K. H.: A physiological method for the quantitative measurement of microbial biomass in soil, Soil Biol. Biochem., 10, 215–221, https://doi.org/10.1016/0038-0717(78)90099-8, 1978. Azooz, R. H., Arshad, M A., and Franzluebbers, A. J.: Pore Size Distribution and Hydraulic Conductivity Affected by Tillage in Northwestern Canada, Soil Sci. Soc. Am. J., 60, 1197–1201, https://doi.org/10.2136/sssaj1996.03615995006000040034x, 1996. Balesdent, J. and Balabane, M.: Major contribution of roots to soil carbon storage inferred from maize cultivated soils, Soil Biol. Biochem., 28, 1261–1263, https://doi.org/10.1016/0038-0717(96)00112-5, 1996. Balesdent, J., Chenu, C., and Balabane, M.: Relationship of soil organic matter dynamics to physical protection and tillage, Soil Till. Res., 53, 215–230, https://doi.org/10.1016/S0167-1987(99)00107-5, 2000. Bengough, A. G., McKenzie, B. M., Hallett, P. D., and Valentine, T. A.: Root elongation, water stress, and mechanical impedance: a review of limiting stresses and beneficial root tip traits, J. Exp. Bot., 62, 59–68, https://doi.org/10.1093/jxb/erq350, 2011. Birkhofer, K., Bezemer, T. M., Bloem, J., Bonkowski, M., Christensen, S., Dubois, D., Ekelund, F., Fließbach, A., Gunst, L., Hedlund, K., Mäder, P., Mikola, J., Robin, C., Setälä, H., Tatin-Froux, F., Van der Putten, W. H., and Scheu, S.: Long-term organic farming fosters below and aboveground biota: Implications for soil quality, biological control and productivity, Soil Biol. Biochem., 40, 2297–2308, https://doi.org/10.1016/j.soilbio.2008.05.007, 2008. Bockstaller, C., Girardin, P., and Van der Werf, H. M. G.: Use of agro-ecological indicators for the evaluation of farming systems, Eur. J. Agron., 7, 261–270, 1997. Bronick, C. J. and Lal, R.: Soil structure and management: a review, Geoderma, 124, 3–22, https://doi.org/10.1016/j.geoderma.2004.03.005, 2005. Büchi, L., Georges, F., Walder, F., Banerjee, S., Keller, T., Six, J., van der Heijden, M., and Charles, R.: Potential of indicators to unveil the hidden side of cropping system classification: actual differences and similarities in cropping practices between conventional, no-till and organic systems, Eur. J. Agron., in review, 2019. Bünemann, E. K., Bongiorno, G., Creamer, R., Deyn, G. B. De, Bünemann, E. K., Bongiorno, G., Bai, Z., Creamer, R. E., Deyn, G. De, Goede, R. De, Fleskens, L., Geissen, V., Kuyper, T. W., and Mäder, P.: Soil quality - A critical review, Soil Biol. Biochem., 120, 105–125, https://doi.org/10.1016/j.soilbio.2018.01.030, 2018. Busscher, W. J.: Adjustment of Flat-Tipped Penetrometer Resistance Data To a Common Water Content, Trans. ASAE, 33, 519–524, https://doi.org/10.13031/2013.31360, 1990. Buyanovsky, G. A. and Wagner, G. H.: Annual Cycles of Carbon Dioxide Level in Soil Air, Soil Sci. Soc. Am. J., 47, 1139–1145, https://doi.org/10.2136/sssaj1983.03615995004700060016x, 1983. Cannell, R. Q., Belford, R. K., Gales, K., Thomson, R. J., and Webster, C. P.: Effects of waterlogging and drought on winter wheat and winter barley grown on a clay and a sandy loam soil, Plant Soil, 80, 53–66, https://doi.org/10.1007/BF02232939, 1984. Carter, M. R., Sanderson, J. B., Holmstrom, D. A., Ivany, J. A., and DeHaan, K. R.: Influence of conservation tillage and glyphosate on soil structure and organic carbon fractions through the cycle of a 3-year potato rotation in Atlantic Canada, Soil Till. Res., 93, 206–221, https://doi.org/10.1016/j.still.2006.04.004, 2007. Celik, I.: Land-use effects on organic matter and physical properties of soil in a southern Mediterranean highland of Turkey, Soil Till. Res., 83, 270–277, https://doi.org/10.1016/j.still.2004.08.001, 2005. Chan, K. Y., Heenan, D. P., and So, H. B.: Sequestration of carbon and changes in soil quality under conservation tillage on light-textured soils in Australia: a review, Aust. J. Exp. Agr., 43, 325–334, https://doi.org/10.1071/EA02077, 2003. Chen, G., Weil, R. R., and Hill, R. L.: Effects of compaction and cover crops on soil least limiting water range and air permeability, Soil Till. Res., 136, 61–69, https://doi.org/10.1016/j.still.2013.09.004, 2014. Colombi, T., Braun, S., Keller, T., and Walter, A.: Artificial macropores attract crop roots and enhance plant productivity on compacted soils, Sci. Total Environ., 574, 1283–1293, https://doi.org/10.1016/j.scitotenv.2016.07.194, 2017. Colombi, T., Torres, L. C., Walter, A., and Keller, T.: Feedbacks between soil penetration resistance, root architecture and water uptake limit water accessibility and crop growth – A vicious circle, Sci. Total Environ., 626, 1026–1035, https://doi.org/10.1016/j.scitotenv.2018.01.129, 2018. Cotrufo, M. F., Wallenstein, M. D., Boot, C. M., Denef, K., and Paul, E.: The Microbial Efficiency-Matrix Stabilization (MEMS) framework integrates plant litter decomposition with soil organic matter stabilization? : do labile plant inputs form stable soil organic matter?, Glob. Change Biol., 19, 988–995, https://doi.org/10.1111/gcb.12113, 2013. Cotrufo, M. F., Soong, J. L., Horton, A. J., Campbell, E. E., Haddix, M. L., Wall, D. H., and Parton, W. J.: Formation of soil organic matter via biochemical and physical pathways of litter mass loss, Nat. Geosci., 8, 8–13, https://doi.org/10.1038/NGEO2520, 2015. CSICM: Directive suisse 2010 de la branche sur la qualité du compost et du digestat. Commission suisse de l'inspectorat du compostage et Comm. suisse l'inspectorat du Compost. la méthanisation, 40 pp., 2010. CTACF: Mise en oeuvre de la technique du Bois Raméal Fragmenté (BRF) en agriculture wallonne, Cent. des Technol. Agron. Communauté Française, 168 pp., 2006. Dal Ferro, N., Sartori, L., Simonetti, G., Berti, A., and Morari, F.: Soil macro- and microstructure as affected by different tillage systems and their effects on maize root growth, Soil Till. Res., 140, 55–65, https://doi.org/10.1016/j.still.2014.02.003, 2014.
da Silva, A. P., Babujia, L. C., Franchini, J. C., Ralisch, R., Hungria, M., and Guimarães, M. de F.: Soil structure and its influence on microbial biomass in different soil and crop management systems, Soil Till. Res., 142, 42–53, https://doi.org/10.1016/j.still.2014.04.006, 2014. Dexter, A. R.: Amelioration of soil by natural processes, Soil Till. Res., 20, 87–100, 1991. Diacono, M. and Montemurro, F.: Long-term effects of organic amendments on soil fertility. A review, Agron. Sustain. Dev., 30, 401–422, https://doi.org/10.1051/agro/2009040, 2010. Dresbøll, D. B., Thorup-Kristensen, K., McKenzie, B. M., Dupuy, L. X., and Bengough, A. G.: Timelapse scanning reveals spatial variation in tomato (Solanum lycopersicum L.) root elongation rates during partial waterlogging, Plant Soil, 369, 467–477, https://doi.org/10.1007/s11104-013-1592-5, 2013. Eavis, B. W.: Soil physical conditions affecting seedling root growth, Plant Soil, 139, 66–89, 1972. Garnczarska, M. and Bednarski, W.: Effect of a short-term hypoxic treatment followed by re-aeration on free radicals level and antioxidative enzymes in lupine roots, Plant Physiol. Biochem., 42, 233–240, https://doi.org/10.1016/j.plaphy.2004.01.005, 2004. Gattinger, A., Muller, A., Haeni, M., Skinner, C., Fliessbach, A., Buchmann, N., Mader, P., Stolze, M., Smith, P., Scialabba, N. E.-H., and Niggli, U.: Enhanced top soil carbon stocks under organic farming, P. Natl. Acad. Sci. USA, 109, 18226–18231, https://doi.org/10.1073/pnas.1209429109, 2012. Govaerts, B., Verhulst, N., Castellanos-Navarrete, A., Sayre, K. D., Dixon, J., and Dendooven, L.: Conservation agriculture and soil carbon sequestration: Between myth and farmer reality, CRC, Crit. Rev. Plant Sci., 28, 97–122, https://doi.org/10.1080/07352680902776358, 2009. Grable, A. R. and Siemer, E. G.: Effects of Bulk Density, Aggregate Size, and Soil Water Suction on Oxygen Diffusion, Redox Potentials, and Elongation of Corn Roots1, Soil Sci. Soc. Am. J., 32, 180–186, https://doi.org/10.2136/sssaj1968.03615995003200020011x, 1968. Grzesiak, M. T., Ostrowska, A., Hura, K., Rut, G., Janowiak, F., Rzepka, A., Hura, T., and Grzesiak, S.: Interspecific differences in root architecture among maize and triticale genotypes grown under drought, waterlogging and soil compaction, Acta Physiol. Plant., 36, 3249–3261, https://doi.org/10.1007/s11738-014-1691-9, 2014. Heinemeyer, O., Insam, H., Kaiser, E. A., and Walenzik, G.: Soil microbial biomass and respiration measurements: An automated technique based on infra-red gas analysis, Plant Soil, 116, 191–195, https://doi.org/10.1007/BF02214547, 1989. Horn, R. and Smucker, A.: Structure formation and its consequences for gas and water transport in unsaturated arable and forest soils, Soil Till. Res., 82, 5–14, https://doi.org/10.1016/j.still.2005.01.002, 2005. Jin, K., Shen, J., Ashton, R. W., Dodd, I. C., Parry, M. A. J., and Whalley, W. R.: How do roots elongate in a structured soil?, J. Exp. Bot., 64, 4761–77, https://doi.org/10.1093/jxb/ert286, 2013. Kahlon, M. S., Lal, R., and Ann-Varughese, M.: Twenty two years of tillage and mulching impacts on soil physical characteristics and carbon sequestration in Central Ohio, Soil Till. Res., 126, 151–158, https://doi.org/10.1016/j.still.2012.08.001, 2013. Kaiser, E. A., Mueller, T., Joergensen, R. G., Insam, H., and Heinemeyer, O.: Evaluation of methods to estimate the soil microbial biomass and the relationship with soil texture and organic matter, Soil Biol. Biochem., 24, 675–683, https://doi.org/10.1016/0038-0717(92)90046-Z, 1992. 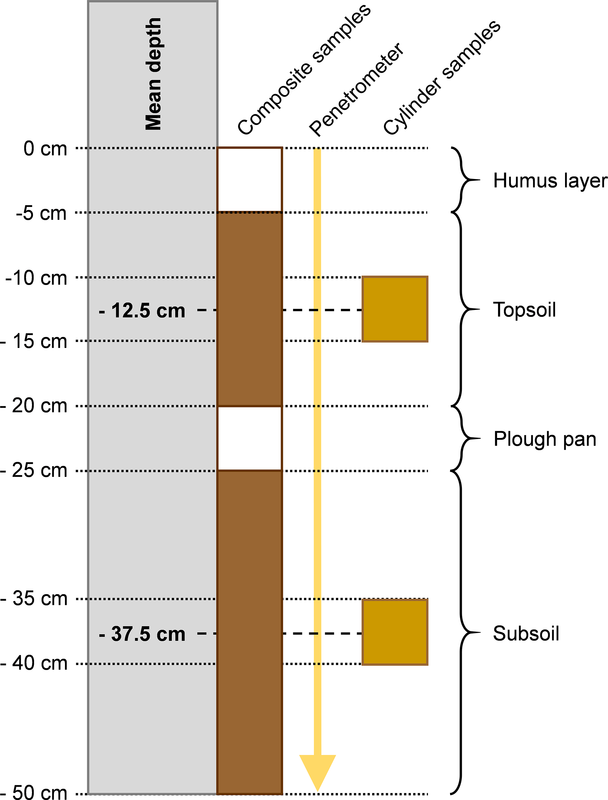 Kätterer, T., Bolinder, M. A., Andrén, O., Kirchmann, H., and Menichetti, L.: Roots contribute more to refractory soil organic matter than above-ground crop residues, as revealed by a long-term field experiment, Agr. Ecosyst. Environ., 141, 184–192, https://doi.org/10.1016/j.agee.2011.02.029, 2011. Keiluweit, M., Nico, P. S., Kleber, M., and Fendorf, S.: Are oxygen limitations under recognized regulators of organic carbon turnover in upland soils?, Biogeochemistry, 127, 157–171, https://doi.org/10.1007/s10533-015-0180-6, 2016. Keiluweit, M., Wanzek, T., Kleber, M., Nico, P., and Fendorf, S.: Anaerobic microsites have an unaccounted role in soil carbon stabilization, Nat. Commun., 8, 1–8, https://doi.org/10.1038/s41467-017-01406-6, 2017. Kong, A. Y. Y. and Six, J.: Tracing Root vs. Residue Carbon into Soils from Conventional and Alternative Cropping Systems, Soil Sci. Soc. Am. J., 74, 1201, https://doi.org/10.2136/sssaj2009.0346, 2010. Koop-Jakobsen, K., Mueller, P., Meier, R. J., Liebsch, G., and Jensen, K.: Plant-Sediment Interactions in Salt Marshes – An Optode Imaging Study of O2, pH, and CO2 Gradients in the Rhizosphere, Front. Plant Sci., 9, 1–11, https://doi.org/10.3389/fpls.2018.00541, 2018. Lal, R.: Soil Carbon Sequestration Impacts on Global Climate Change and Food Security, Science, 304, 1623–7162, https://doi.org/10.1126/science.1097396, 2004. Lavallee, J. M., Conant, R. T., Paul, E. A., and Cotrufo, R. T.: Incorporation of shoot versus root-derived 13C and 15N into mineral-associated organic matter fractions? : results of a soil slurry incubation with dual-labelled plant material, Biogeochemistry, 137, 379–393, https://doi.org/10.1007/s10533-018-0428-z, 2018. Leifeld, J., Reiser, R., and Oberholzer, H. R.: Consequences of conventional versus organic farming on soil carbon: Results from a 27-year field experiment, Agron. J., 101, 1204–1218, https://doi.org/10.2134/agronj2009.0002, 2009. Lesturgez, G., Poss, R., Hartmann, C., Bourdon, E., Noble, A., and Development, L.: Roots of Stylosanthes hamata create macropores in the compact layer of a sandy soil, Plant Soil, 260, 101–109, 2004. Mäder, P., Fliessbach, A., Dubois, D., Gunst, L., Fried, P., and Niggli, U.: Soil fertility and biodiversity in organic farming, Science, 296, 1694–1697, https://doi.org/10.1126/science.1071148, 2002. Manzoni, S., Schimel, J. P., and Porporato, A.: Responses of soil microbial communities to water stress? : results from a meta-analysis, Ecology, 93, 930–938, https://doi.org/10.1890/11-0026.1, 2012. Martínez, I., Chervet, A., Weisskopf, P., Sturny, W. G., Etana, A., Stettler, M., Forkman, J., and Keller, T.: Two decades of no-till in the Oberacker long-term fi eld experiment? : Part I. Crop yield, soil organic carbon and nutrient distribution in the soil profile, Soil Till. Res., 163, 141–151, https://doi.org/10.1016/j.still.2016.05.021, 2016a. Martínez, I., Chervet, A., Weisskopf, P., Sturny, W. G., Rek, J., and Keller, T.: Two decades of no-till in the Oberacker long-term field experiment: Part II. Soil porosity and gas transport parameters, Soil Till. Res., 163, 130–140, 2016b. Mendiburu, F. D.: agricolae: Statistical Procedures for Agricultural Research, R Package Version 1.2-3, 2015. Pinheiro, J., Bates, D., DebRoy, S., and Sarkar, J.: nlme: Linear and Nonlinear Mixed Effects Models (Software), 2013. Pires, L. F., Borges, J. A. R., Rosa, J. A., Cooper, M., Heck, R. J., Passoni, S., and Roque, W. L.: Soil structure changes induced by tillage systems, Soil Till. Res., 165, 66–79, https://doi.org/10.1016/j.still.2016.07.010, 2017. Porterfield, D. M. and Musgrave, M. E.: The tropic response of plant roots to oxygen: Oxytropism in Pisum sativum L., Planta, 206, 1–6, https://doi.org/10.1007/s004250050367, 1998. Powlson, D. S., Stirling, C. M., Jat, M. L., Gerard, B. G., Palm, C. A., Sanchez, P. A., and Cassman, K. G.: Limited potential of no-till agriculture for climate change mitigation, Nat. Clim. Change, 4, 678–683, https://doi.org/10.1038/nclimate2292, 2014. Qi, J., Marshall, J. D., and Mattson, K. G.: High soil carbon dioxide concentrations inhibit root respiration of Douglas fir, New Phytol., 128, 435–442, 1994. R Core Team: R: A Language and Environment for Statistical Computing, available at: http://www.r-project.org (last access: 31 August 2018), 2017. Rasmussen, C., Heckman, K., Wieder, W. R., Keiluweit, M., Lawrence, C. R., Berhe, A. A., Blankinship, J. C., Crow, S. E., Druhan, J. L., Hicks Pries, C. E., Marin-Spiotta, E., Plante, A. F., Schädel, C., Schimel, J. P., Sierra, C. A., Thompson, A., and Wagai, R.: Beyond clay: towards an improved set of variables for predicting soil organic matter content, Biogeochemistry, 137, 297–306, https://doi.org/10.1007/s10533-018-0424-3, 2018. Rasool, R., Kukal, S. S., and Hira, G. S.: Soil organic carbon and physical properties as affected by long-term application of FYM and inorganic fertilizers in maize-wheat system, Soil Till. Res., 96, 64–72, https://doi.org/10.1016/j.still.2008.05.015, 2007. 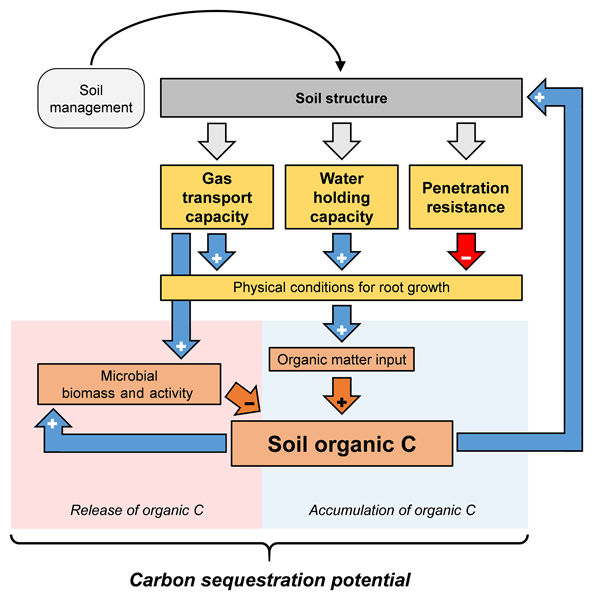 Rasse, D. P., Rumpel, C., and Dignac, M.-F.: Is soil carbon mostly root carbon? Mechanisms for a specific stabilisation, Plant Soil, 269, 341–356, https://doi.org/10.1007/s11104-004-0907-y, 2005. Reynolds, W. D., Drury, C. F., Yang, X. M., and Tan, C. S.: Optimal soil physical quality inferred through structural regression and parameter interactions, Geoderma, 146, 466–474, https://doi.org/10.1016/j.geoderma.2008.06.017, 2008. Rich, S. M. and Watt, M.: Soil conditions and cereal root system architecture: review and considerations for linking Darwin and Weaver, J. Exp. Bot., 64, 1193–208, https://doi.org/10.1093/jxb/ert043, 2013. Schjonning, P. and Rasmussen, K. J.: Soil strength and soil pore characteristics for direct drilled and ploughed soils, Soil Till. Res., 57, 69–82, https://doi.org/10.1016/S0167-1987(00)00149-5, 2000. Sinaj, S. and Richner, W.: Principes de fertilisation des cultures agricoles en Suisse (PRIF 2017), Rech. Agron. Suisse, 8, 1–45, 2017. Smith, P., Martino, D., Cai, Z., Gwary, D., Janzen, H., Kumar, P., McCarl, B., Ogle, S., O'Mara, F., Rice, C., Scholes, B., Sirotenko, O., Howden, M., McAllister, T., Pan, G., Romanenkov, V., Schneider, U., Towprayoon, S., Wattenbach, M., and Smith, J.: Greenhouse gas mitigation in agriculture, Philos. T. R. Soc. B, 363, 789–813, https://doi.org/10.1098/rstb.2007.2184, 2008. Soane, B. D.: The role of organic matter in soil compactibility: A review of some practical aspects, Soil Till. Res., 16, 179–201, https://doi.org/10.1016/0167-1987(90)90029-D, 1990. Soil Survey Staff: Soil Survey Laboratory Information Manual, in: Soil Survey Investigations Report No. 45, Version 2.0, edited by: Burt, R., United States Department of Agriculture, Natural Resources Conservation Service, Lincoln, Nebraska, 2011. Stewart, C. E., Follett, R. F., Pruessner, E. G., Varvel, G. E., Vogel, K. P., and Mitchell, R. B.: Nitrogen and harvest effects on soil properties under rainfed switchgrass and no-till corn over 9 years: Implications for soil quality, GCB Bioenergy, 7, 288–301, https://doi.org/10.1111/gcbb.12142, 2014. Swiss Federal Council: Verordnung über die Direktzahlungen an die Landwirtschaft (Direktzahlungsverordnung, DZV), 1–107, 2014. Swiss Federal Research Stations: Referenzmethoden der Eidgenössischen landwirtschaftlichen Forschungsanstalten: 2. Bodenuntersuchung zur Standortcharakterisierung., edited by Agroscope Reckenholz-Tänikon, Agroscope Reckenholz-Tänikon ART, Zurich, 1996. Thomson, C. J., Colmer, T. D., Watkin, E. L. J., and Greenway, H.: Tolerance of wheat (Triticum aestivum cvs. Gamenya and Kite) and triticale (Triticosecale cv Muir) to waterlogging, New Phytol., 120, 335–344, 1992. Valentine, T. A., Hallett, P. D., Binnie, K., Young, M. W., Squire, G. R., Hawes, C., and Bengough, G. A.: Soil strength and macropore volume limit root elongation rates in many UK agricultural soils, Ann. Bot., 110, 259–270, https://doi.org/10.1093/aob/mcs118, 2012. Watkin, E. L., Thomson, C. J., and Greenway, H.: Root Development and Aerenchyma Formation in Two Wheat Cultivars and One Triticale Cultivar Grown in Stagnant Agar and Aerated Nutrient Solution, Ann. Bot., 81, 349–354, 1998. Weisskopf, P., Reiser, R., Rek, J., and Oberholzer, H. R.: Effect of different compaction impacts and varying subsequent management practices on soil structure, air regime and microbiological parameters, Soil Till. Res., 111, 65–74, https://doi.org/10.1016/j.still.2010.08.007, 2010. Young, I. M., Blanchart, E., Chenu, C., Dangerfield, M., Fragosos, C., Grimaldi, M., Ingram, J., and Monrozier, L. J.: The interaction of soil biota and soil structure under global change, Glob. Change Biol., 4, 703–712, https://doi.org/10.1046/j.1365-2486.1998.00194.x, 1998. Zomer, R. J., Bossio, D. A., Sommer, R., and Verchot, L. V.: Global Sequestration Potential of Increased Organic Carbon in Cropland Soils, Sci. Rep., 7, 1–8, https://doi.org/10.1038/s41598-017-15794-8, 2017. The role of soil aeration in carbon sequestration in arable soils has only been explored little, especially at the farm level. The current study, which was conducted on 30 fields that belong to individual farms, reveals a positive relationship between soil gas transport capability and soil organic carbon content. We therefore conclude that soil aeration needs to be accounted for when developing strategies for carbon sequestration in arable soil.